Another Sutherland to Surf fun run took place on the 25th July. The weather was more pleasant than last year, but my preparation was not as good. Nonetheless I cut about half a minute off my overall time, so in the circumstances I was quite pleased. The results this year were not separated into runners and walkers, so the analysis is not quite as meaningful. 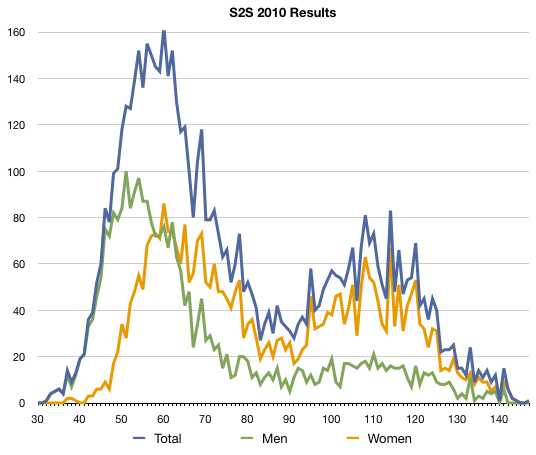 You can, however, see the two groups appearing in the finishing time graph below — the first peak represents the influx of runners finishing and the second, later peak the walkers.